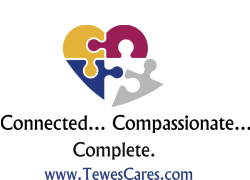 With extensive credentials and years of health care experience working with aging adults and those with chronic or traumatic condition, Leslie-Alin Tewes offers the right balance of expertise navigating the continuum of care with compassionate, personalized attention that individuals deserve. As a Medical Social Worker and Director of Patient Advocacy and Discharge Planning in a variety of health care settings, Leslie has effectively guided individuals and their families in challenging times with the goal of the highest standards of health care and quality of life. As a Licensed Nursing Home Administrator, she has been a leader in upholding the highest ratings of facility care from the Federal Government’s 5 Star Quality Rating System, the Joint Commission and Consumer Advocacy groups. CREDENTIALS: Leslie is a Certified Care Manager, holds a Master's of Public Administration degree specializing in Health Care, a Graduate Certificate of Advanced Studies in Gerontology, a Bachelor’s Degree in Psychology with a concentration in Social Work and related interest in Music Therapy. She is a Licensed Nursing Home Administrator. With Nursing Home Incident Command Center Training, she is keenly able and aware of the importance of disaster preparedness. NETWORKS: Leslie holds memberships in the Aging Life Care Association (previously known as the National Association of Professional Geriatric Care Managers, National Association of Estate Planners & Councils, various Geriatric Committees in CT/NY and Chamber of Commerce- among others. PHILOSOPHY: Having a core belief that aging can be a continued stage of development and growth, she is also a Certified Eden Alternative Associate. COMMUNITY: A Lifetime Girl Scout; actively involved in her community including as a board member of the National Charity League- Nutmeg Chapter and member of the Danbury Hospital Patient/ Family Advisory Council. SERVING: In private practice serving CT and NY. Inter-state, remote care management for those separated by distance or circumstances. Connected to the community with vetted resources and referrals. Qualified and experienced in both medically related support services and facility regulations/operations. Committed to maximizing the independence and autonomy of older people striving to ensure the highest quality and most cost-effective health and human services. Advocates for her clients with intrepid determination for the highest quality medical care possible.